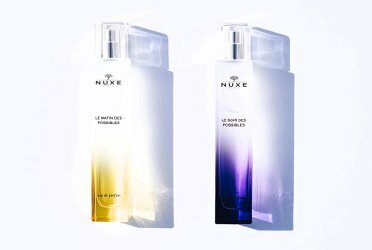 French skincare & cosmetics firm Nuxe has launched two new fragrances, Le Matin des Possibles and Le Soir des Possibles. Le Matin des Possibles ~ Developed by perfumer Quentin Bisch. "In the first light / When the light shines through and awakens all our senses / We have the sensation that the World is ours / Experience the fresh and luminous scent of Le Matin des Possibles, a fragrance with notes of orange blossom." Additional notes include petitgrain and cashmere musk. Le Soir des Possibles ~ Developed by perfumer Louise Turner. "In the last light When shadows come to life and ignite all our senses / We trust only in our desires / Experience of the sensual and bold perfume of Le Soir des Possibles, a fragrance with notes of jasmine." Additional notes include cassis and patchouli. Nuxe Le Matin des Possibles and Le Soir des Possibles are available in 50 ml Eau de Parfum.